Many of you remember the sniper-style attacks committed around the Washington DC Beltway area in 2002. Ten people were killed and three others were shot during a three-week period. Lee Boyd Malvo was 17 at the time he committed the crimes and sentenced to life in prison without parole. John Allen Muhammad, also found guilty, was executed in 2009. 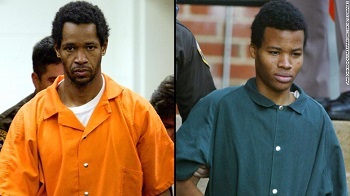 News headlines this week read: Judge overturns life without parole sentence for DC sniper Lee Boyd Malvo. His sentence was thrown out because of his age at the time of the shootings. Both Muhammad and Malvo’s testimony provide good examples to highlight forensic statement analysis as it relates to deception. He didn’t say, “The evidence will show I was not the shooter” or “The evidence will show someone else was the shooter.” because he couldn’t; that would have been a lie. Instead he said he had “nothing to do with these crimes.” I had nothing to do with is not a true denial. In 2003, he was convicted of capital murder. After he was arrested, and during police questioning, Lee Boyd Malvo told police he pulled the trigger in all of the sniper attacks that terrified the Washington area. “I intended to kill them all,” said Malvo. A month later he recanted his testimony that he pulled the trigger in all the shootings. He then said he was only the spotter in all but two. The defense testified that Malvo’s initial statements claiming responsibility occurred while he was still under Muhammad’s influence. He added that if Malvo was lying later it didn’t make sense for him to still admit he was the triggerman in two killings. Because Muhammad was convicted and subsequently executed, the jury was not convinced that Malvo pulled the trigger in all the shootings. The next time you hear someone say “basically” know that you’re not getting the whole story or that person isn’t telling you everything they know about the situation.